A golf cart rear seat is great to have to carry kids or company around town, hold grocery bags, or to haul gardening supplies. For those living in a golf cart it's an especially useful accessory. It's great for taking friends out to dinner with. us or for picking up the grandkids. 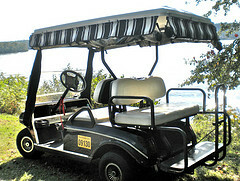 You can purchase your golf cart as a 4 seat golf cart with the rear seat or you can add it later. Most rear seats are rear facing and are added later to a two seat golf cart. These rear seat kits can be purchased on line at places like Amazon. 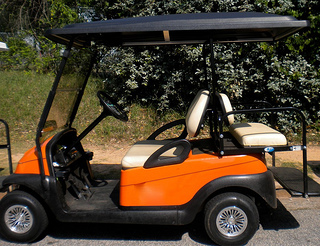 The kits are specific to your golf cart make, model and year. You will need to know which model golf cart you own. Next decide on a seat color - the three most common options are beige, white or black. They run around $300. Be sure to pick a seat cover color that matches the color of the front seats. 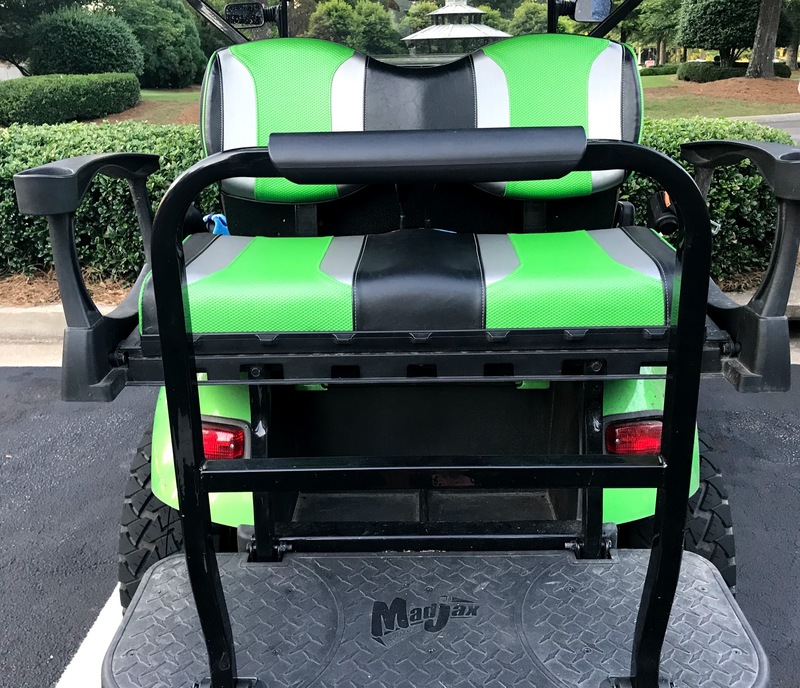 You might notice a few upgrades on this Madjax golf cart rear seat kit. 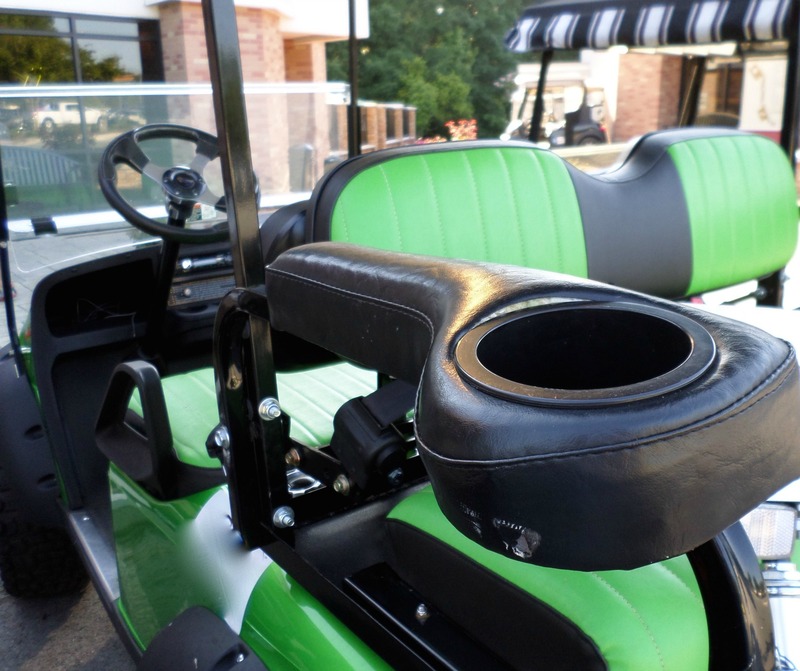 Wide armrests with built in drink holders and an extra long golf cart safety grab bar. Many people also add a safety grab bar. 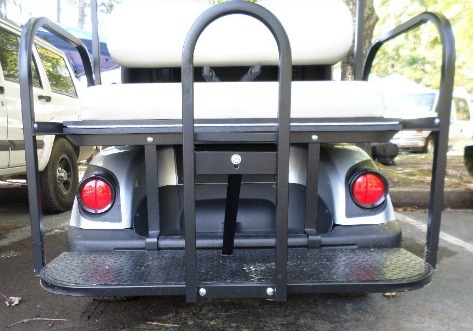 It gives your passengers something to hang onto when they hit a bumpy stretch of golf cart paths. And we have them in Peachtree City - tree roots get under the paths and there is some serious bouncing for your back seat riders. This is a universal golf cart part and works on most fixed and rear flip seats. This golf cart rear seat trailer hitch with receiver and grab bar is a useful golf cart accessory for anyone who wants to do some hauling. 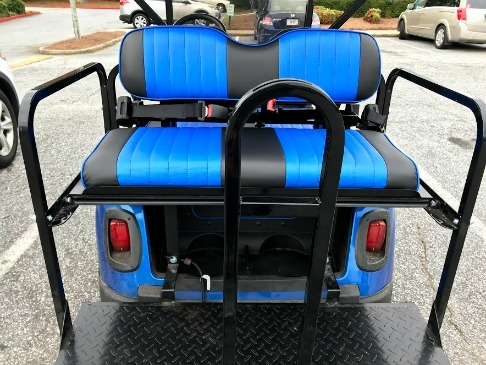 This golf cart accessory is made to fit a variety of rear seats so for some rear seats, modification may or will be required. What's so cool about the golf cart flip seats is that they can easily convert from extra seating to a handy cargo carrier. 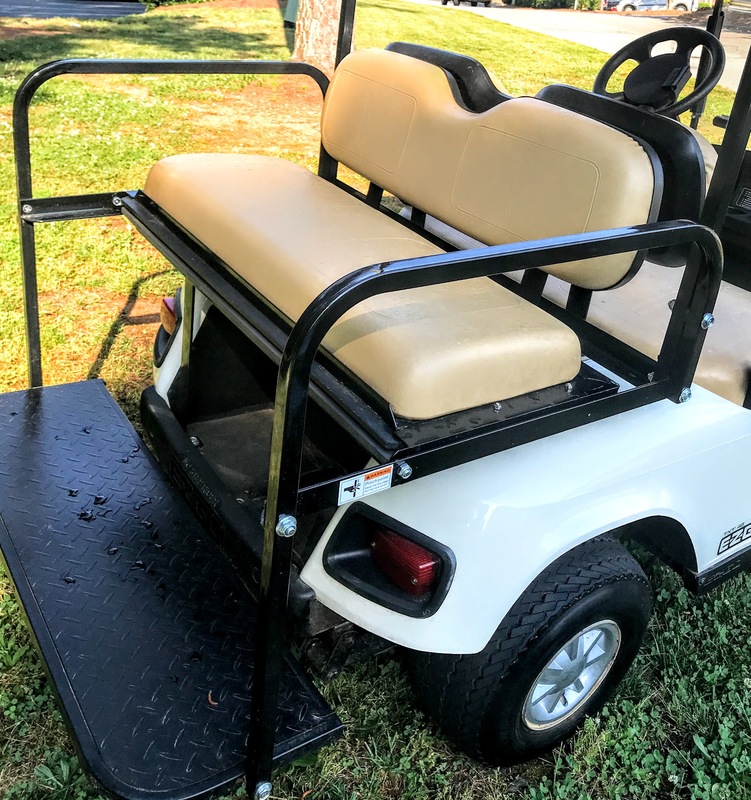 We added a golf cart flip seat to our Club Car - this way we can use it to take more people on the cart or use it around the yard to haul mulch, move plants or carry away debris. 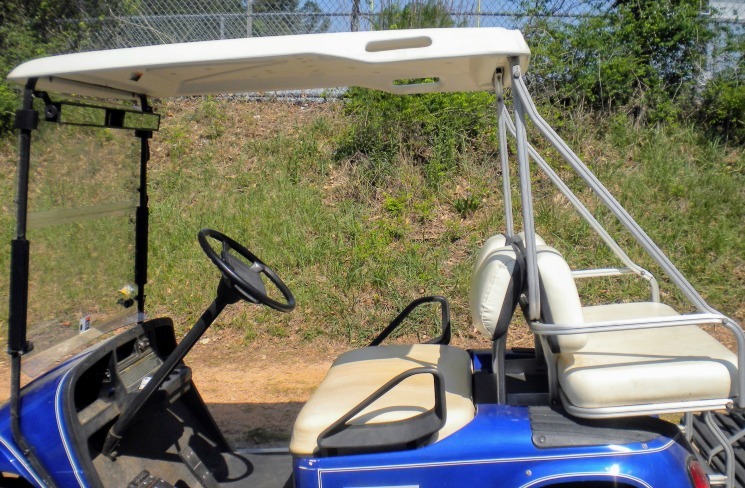 Golf cart flip seats are available for Club, EZ GO and Yamaha golf carts. You can contact your local golf cart dealer to order and install one for you. Or you can do it yourself by ordering a flip seat on line. You will need to know the make, model and year of your golf cart. 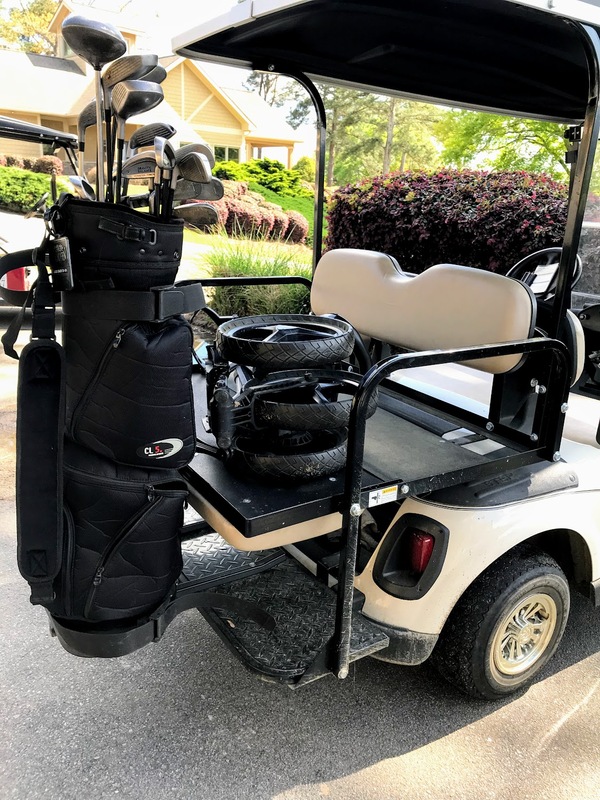 Your golf cart will probably require heavy duty springs if you add the extra rear seat yourself. For the comfort of your back seat passengers add arm rests and cup holders. This golf cart accessory comes as a set of two and with several color options - beige, black, ivory and hunter green. When you add a rear seat you may want to switch out your golf cart top to an extended one that protects your rear seat passengers. This short top leaves your passengers in the back unprotected from the hot sun or a cold rain. 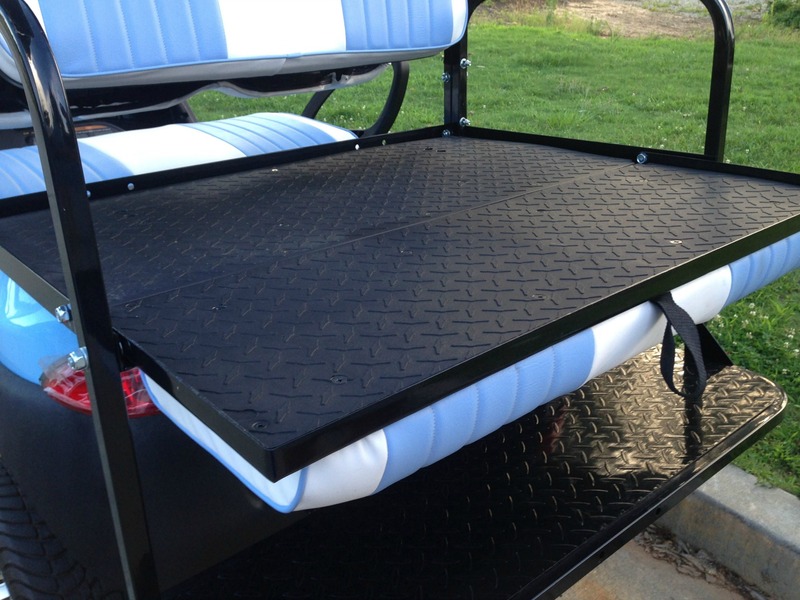 See how this 80" golf cart top extends over the rear seat? When you purchase a top check to see if the struts come with it. Adding a rear seat can be useful in many different ways. The cart can be used on and off the golf course, can accommodate more passengers, can be useful for hauling and often it's easier to sell than a 2 passenger cart.